If you really want to experience a town like a local, hit one of its markets. Markets speak volumes about a place, and you come away wiser about the town’s culture, cuisine, and special quirks. Nuremberg hosts a number of traditional markets over the year. Other than a chance to fill your shopping bags with great goodies, these markets are the perfect way to feel the real buzz of the city and hang out with the locals. 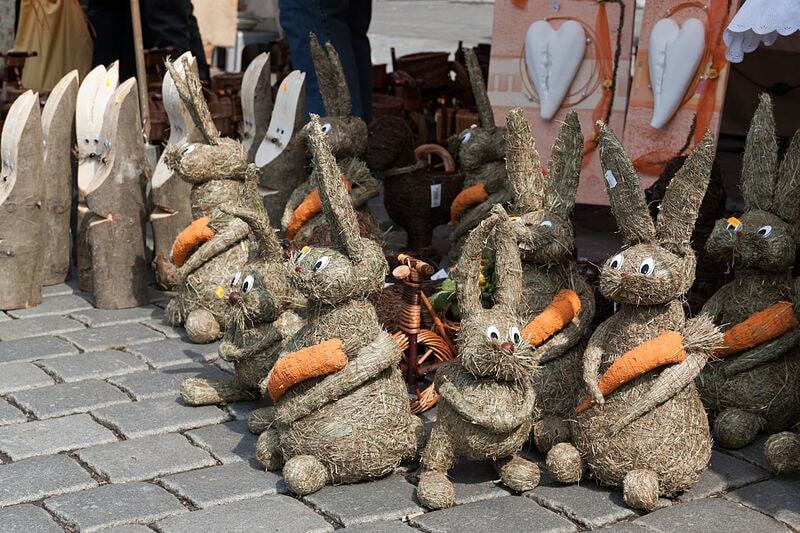 Nuremberg celebrates the arrival of spring with the first theme market of the year – the Easter Market. This historic market, held in the Hauptmarkt Square in the castle compounds, can be traced back to 1424. Over 100 stalls line the market, ready to woo visitors with an endless variety of tableware, household goods, beautiful creations of woodcarvers and artisans, and yummy food. This is also a one-stop shop for all your Easter shopping, including painted eggs, flowers, table decorations, gift items, etc. Cooking demonstrations are a highlight of the market. The Nuremberg Flea Market is the biggest flea market in Germany and spreads across the Old Town, drenching the entire city in festive buzz. As many as 4,000 stalls and booths manned by individuals or businesses jostle for space at the market, tempting the crowds with an astounding variety of fare. Walking the grounds – filled with every imaginable item, from porcelain goods to historic tools, antique furniture to ancient jewelry, rare books to clothes – is no less than a treasure hunt. If you have a thing for pure, organic stuff, the Experience Organic Market is just the right place for you. Held at the Hauptmarkt Square, this market offers an irresistible collection of organic cosmetics and wellness products, home décor, fashion accessories, food and drinks, and more. Cooking demonstrations held at the market teach visitors the nuances of organic cooking as well. The market typically records footfall of around 40,000. Nuremberg Farmers Market Mile is much more than a regular farmers’ market. Along with fresh fruits, vegetables, sausages, wine, and beer, you get the chance to fill your bags with local (Bavarian or Franconian) specialties. Exotic foods like ostrich meat, Angus-beef, horseradish, etc., are also available at this market. Live music adds a dollop of a festive feel to your shopping experience, while children are kept entertained with tractors and a lot of fun activities. Come September, the streets of Nuremberg fill with the infectious buzz of the Autumn Market and the heady aroma of onion tarts and wine. Also held in the Hauptmarkt Square, the Autumn Market is not a mere market but a full-fledged festival with shopping, live performances, and delicious cuisines. From kitchen items, pottery, and crockery, to arts and crafts, hand-blown glass, antique stuff, and ceramic items – expect to find irresistible treasures and great deals at every booth. Don’t leave without trying the local delicacy of chopped sausages and onions smothered in a spicy sauce. Nuremberg is known for one of the most romantic and festive Christmas markets in the country. Around 180 wooden stalls entice visitors with Glühwein, gingerbread, sausages, etc., along with handmade Christmas ornaments and trinkets. If you are ready to be a little adventurous, try the Feuerzangenbowle – a potent drink made by dipping a sugar loaf in rum, and setting it on fire over a bowl of mulled wine (a concoction of red wine, spices, and orange peel). Nuremberg’s Christkindlesmarkt boasts the largest bowl of this Christmas drink in the world, with a capacity of 9,000 liters! Nuremberg also scores major brownie points with kids with its special Christmas market for children, complete with carousels, rides, hands-on activities, cookie-baking sessions, and lots more. The supermART is a great scope for upcoming artists and fashion designers to showcase their creations and for visitors to grab beautiful art and fashion at an affordable price. As many as 85 talented individuals display their art and designs across 4,000 sq.m of space. Often, you can even catch the artists at work. Live music performances at the venue ups the festive feel of this market.